Boquete Outdoor Adventures offers the usual array of adventure activities: whitewater rafting, canopy tours and multi-day trips. Luckily for kayakers they also have whitewater kayaking equipment and tours. We’ve contacted a number of adventure outfitters throughout Central America looking for whitewater kayaking equipment. 90% of them never got back to us and the other 10% tried to sell us on rafting tours. Jim, owner of Boquete Outdoor Adventures (Boquete, Panama) returned our email [ad#reviews] within 24 hours and not only ran down our options but gave us plenty of information on the surrounding area and other activities. We opted to attach ourselves as kayakers to a pre-booked rafting trip, but when we arrived in Boquete we found that the group had canceled. Without a second though Jim told us that the two of us could do the river anyway with just kayak guides so we headed out early the next morning on the Rio Chiriqui. Our guides, Demus and Jose were excellent, really experienced kayakers who knew how to have fun on the river. The guided us down without babying us and despite my hesitations (my previous river run was awful), they made sure we challenged ourselves. Although they were professional and focused on safety, it was more like kayaking with friends who knew the river rather than paid guides, which made the experience even better. The Rio Chiriqui was a pretty straightforward Class III at lower levels, and we were able to read and run most of the sections without a problem. Although we did not do any other tours with Boquete Outdoor Adventures, our experience kayaking was great. We highly recommend them for adventure activities. The same thing forward, the same thing backward…a palindrome. 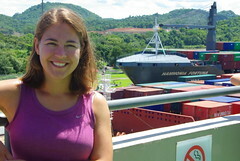 We had finally made it to the Panama Canal. Arriving in Panama City at the crack of dawn presented a new problem for us. Usually when we arrive at dawn we walk into a hotel and sleep for a couple more hours. This time we walked to six different hotels before finding one (which ended up being the most expensive thus far of the entire trip) that didn’t want to charge us by the hour. Things were really going well. As one of Spain’s first settlements in the Americas, Panama City has tons of old Spanish ruins. To be honest, these weren’t particularly special but what was interesting was the museum at the ruins of Panama Viejo. This museum detailed the history of the Spanish Conquest and Panama’s importance 400 years ago. Spain used Panama to move goods into the Pacific ocean and to colonize the Pacific side of South America. Later burned by English privateers, Panama City was rebuilt and continued to act as method of commerce between Europe and the entire Pacific. It would be two hundred more years before the French would first begin working on a canal (in then Colombia) before Panama gained independence and allowed the US to do the job. After two wrong buses we finally got to the the big ditch…also known as the Panama Canal. The Pacific side of the canal has two sets of locks and one of these, the Miraflores Locks, has a museum and observation deck where we learned about the canal’s construction and watched two boats lowered simultaneously in two different locks. While watching I couldn’t help but think that with two locks side by side the water could be recycled between the locks, rather than require a constant flow of water from the lake. It seems however that the abundance of water here lead the canal designers to ignore this option and instead fill the locks with water from the lake and then send the same water out to sea. As part of the canal expansion plan, there are talks of building new locks (just like non-engineer Danny thought up) so that bigger boats will be able to use the canal. I’m sure the original locks were designed this way for a reason but that reason eludes me for now; anybody care to shed some light? 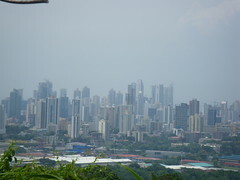 Panama City is by far the most modern city we’ve visited in Central America, yet it still has its quirks. City buses are still old US school buses and some even play music when the horn is honked…rather than the boring sound of a honking horn. Mostly though, it shopping malls and skyscrapers reminded us more of the USA than anywhere else we’d been so far.